The principal fiction in the president’s speech in Saudi Arabia was the claim that we share ‘common values’ with the sharia society. So for what exactly is the “extreme vetting” going to vet? 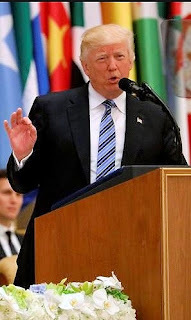 That was the question I could not shake from my mind while listening to President Trump’s speech in Saudi Arabia on Sunday to dozens of Sunni Islamic leaders and a global television audience. There were certainly some positives in the president’s rhetoric. Trump did not cite American policy or “arrogance” as a contributory cause of jihadist savagery, as President Obama was wont to do. He was less delusional about the splendor of Islam than were Obama and President George W. Bush. Gone were absurd inflations of Islam’s historical achievements and place in the American fabric; gone were allusions to the “religion of peace and love.” In their place was an acknowledgment that Islam is besieged by a “crisis” of terror that is engulfing the world, a crisis that is ideological in nature and that only Muslims themselves can solve. All true. Nevertheless, the theme that came through the speech is that terrorism is something that happens to Islam, rather than something that happens because of Islam. That is simply not the case, even though it is true, as Trump asserted, that the vast majority of those killed by Muslim terrorists are themselves Muslims. The principal fiction in “principled realism” is that we share “common values” with Sunni Arab sharia societies. That is problematic because these purported “common values” — in conjunction with “shared interests” — are said to be the roots of Trump’s approach.